In preparation for our trip to Red Deer, AB tomorrow, I took Epic for a bath at the Dog Wash this evening. I let her run around the room while I got ready and this time, I had her climb into the tub herself. Epic has never been particularly fond of the tub, it’s been a grin and Bear it kind of thing for her. today, after I had finished bathing Epic, I used the nozzle to wash the remaining suds and hair towards the drain. Epic thought that biting at (and stomping on) the water was a grand time, I was so pleased to see her relax and enjoy herself that even though I was finished, I put another dollar in the machine and played with her a minute longer! 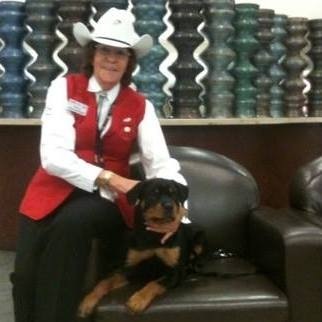 Today we traveled to Red Deer Alberta where I am going to be teaching a rally obedience seminar. When the seminar was scheduled, I debated whether I should leave Epic with a friend of mine or take her with me on the plane. With the exception of staying a few evenings with Sean, she has never been without me at home for a whole day, much less overnight in a strange place. I have a few friends that would be willing to take her but I know how much work a puppy is and was not comfortable foisting that work on anyone. I considered the length of the flight, the airports we were flying in/out of and Epic’s comfort level in her airline style crate. I also considered Epic’s ability to settle into a new environment and meet new people with me. After a week or so if deliberation,I decided that 3-4 hours (return trip) in her crate in an airplane and travelling with me to a new place would be equally or less stressful for her than staying home with a friend. We flew out of the Brandon Airport (YBR) which is by far the tiniest airport I have ever been in. There is one commercial passenger flight into the airport and one out of the airport each day. Epic traveled in a VariKennel 400, tied together with cable ties. I have the proper bolts for the crate but feel the cable ties are more secure – they will not come undone unless someone cuts them, on purpose. I lined the kennel with a blanket from home sprayed D.A.P., clipped a dish to the door so the airline attendants could give Epic water in case of delays and and left a bully stick in the crate for her to chew on. At the airport, I checked in, had the appropriate stickers placed on Epic’s crate (“live animal” and “this side up”). Then the label containing my flight info, and the baggage tag was attached to her crate and I had to take her through security. After security screening, Epic was wheeled away from me to the holding area just prior to boarding, and I have to admit, I had a teeny moment of panic. Fortunately, the plane in and out of Brandon is a Bombardier Q400, a turboprop that carries all of 78 passengers. This plane is so small that we have to walk out onto the tarmac to board and we can see the baggage handlers loading the plane. As I walked out, I saw the two luggage baggage handlers look into the crate, smile and say something to Epic and then lift her gently up onto the conveyor. The other thing about these tiny planes is that when you sit in the back seats you can hear the guys loading the plane talking to each other…which means we could also hear any animals in distress and I didn’t hear any puppy screaming during the entire flight. When we landed, Because I was sitting on the left side of the plane, I could see that Epic’s crate was the first thing off the plane. Once again, the baggage handlers looked into the crate, said something and then lifted her gently onto her very own cart and she was whisked away before I even got off the plane. It was a bit of a hike from the plane to the baggage carousels but my friend Audra, who picked me up said she would wait by the oversized luggage belts so that Epic wouldn’t have to wait alone. As it was, Epic arrived before the rest of the baggage so we were able to collect her first. She did not look any worse for wear but I knew she would have to pee. Before heading outside we stopped to get Epic’s photo with one of the Calgary white hat volunteers who was a great sport and who also directed us to the small off leash dog potty area. From the Calgary Airport, we headed straight to Audra’s in Red Deer where Epic settled in like a princess. She only got yelled at by Audra’s dogs once, and seemed not to be overly traumatised by it. This evening was her first sleepover, not at home, and she settled in perfectly in her crate with her blanket and toys from home. this is where having a crate trained puppy begins to pay off in spades! Today I taught a Really Seminar in Red Deer. Epic came with me and I set her up, in her crate, in the same area as the other dogs. I wanted to see how she would settle in and she did wonderfully either chewing her bully stick or watching the others quietly from her crate. Throughout the day, she was attended to mostly by Audra who fed her and took her out to potty. By the time the evening seminar rolled around she was a tad whiny and cranky but it was a very long day for all of us and she fell asleep quickly once we got back to Audra’s. After breakfast at about 8am, Epic napped in her crate until about 11:30am. I guess she was one tired puppy! Once we had breakfast, Audra and I took the dogs for a walk around her neighbourhood and to a park where Audra was kind enough to take some lovely photos of us. 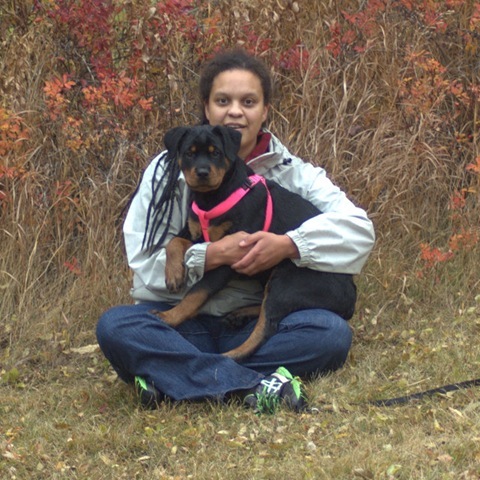 After our walk , Audra and I took Epic and Gibson to Red Deer College for some tracking. We met up with some folks I had only known from facebook, Cindy and Marlee. By the time we got there both ladies had laid tracks for their dogs so we did a couple of short tracks with Epic. Audra showed me how to train the beginnings of footstep tracking (essentially one treat in each footstep) and Epic was incredibly enthusiastic. She has a unique style and lay down and crawled on the track. She was working, using her nose and following the footsteps/cookies….just on her belly. This is a style, heretofore unseen by Audra, Marilee or Cindy but no one suggested we change anything, I am guessing, because Epic was working through it. Towards the end of the track (at the jackpot) Epic did stand up to eat her cookies so I have a feeling that one day, she just might track on all 4 feet. Epic did two tracks and managed to eat a whole package of Smack Snacks in the process. With a full tummy and a big drink, I settled her in her crate in the van while Cindy’s two dogs and Gibson ran a track. After tracking, Audra took Epic and I to the Red Deer Hospice for a visit. I have never been to a hospice or done any therapy work with Bear but was thrilled to have the opportunity for to meet some new people in a new environment – and to perhaps brighten someone’s day. The Hospice is a wonderful facility, very home like and when we walked in the first thing I noticed was the smell of some sort of delicious desert cooking – it did not smell like hospital at all. After meeting the staff, 3 residents indicated that they felt like having a puppy visit. Epic walked into each room bravely and went to greet each person. She sat nicely for cookies (or in one case, Cheetos) and then lay down quietly while Audra and I chatted with each person about her. She was incredibly interested in one woman’s knitting and the same woman’s knitted slippers – as interested as she is in my mittens at home (VERY!) but I managed to keep her distracted once I caught onto what had piqued her interest. We were there for maybe 45 minutes and she was a very good dog, especially considering her age. I have never really considered therapy work for Epic, it’s something that requires a certain amount of time, dedication and in some cases, a very thorough screening process. I have never felt that I had the time for this given my very long days and often very busy weekends, but it’s something I think Epic could be very good at, given her laid back personality. After our hospice visit, Audra, Cindy, and I went for dinner while Epic rested in her crate. When we returned to Audra’s, Epic was cranky, restless and incredibly mouthy, something I rarely see in her. Nothing would settle her down. After about 40 minutes of this, my frustration was skyrocketing, which is also rare, so I decided to settle in her crate in the guest room to see if she was so overtired, she couldn’t stop. I took her down to her crate settled her in with a bully stick, turned the light out and shut the door behind me. I did not hear a peep from Epic for the rest of the evening. Evidently, the weekend’s activities were catching up to her and she needed her sleep. I let her to potty once before I went to bed and then she settled in for the rest of the evening. Today we returned home from Red Deer. Epic did wonderfully again on the plane. Since we left from a larger airport a baggage handler had to take her from security to the plane in Calgary but I did see her come off the plane on the other end. Later in the day, Sean returned home early from Cyprus. I wasn’t sure how Epic would react to him but she remembered him and was as excited to see him as the rest of us! The rest of this week has been low key for all of us, given the busy weekend. We did not go to class this week but we have continued to work on shaping the free stack for conformation throughout the day and things are coming along nicely. Now that things are slowing down (relatively) for the winter I’m taking some time to consider what I would like to work on this year. I had look at my 2011/2012 goals and, while we worked little bit on all of them, the only ones we achieved was fixing the back up 3 steps for rally and getting started with Nose Work. Two is better than none right? What have discovered is that it’s really hard to stay motivated to do something when that something has no real application in our competition lives or our daily lives. I have given up on the long stand/down – we aren’t likely to ever compete in any event that requires either exercise. Same goes for retrieving. Will keep Bear fit and healthy. Will help us to be successful in the competition ring. To this end, here is a list of things I’d like to try accomplish in 2013. Improve weave pole entrance at high speed. Improve Bear’s ability to focus when highly aroused. Improve Bear’s overall fitness and muscle tone with FitPAWS equipment, his backpack and his cart.. Improve Bear’s flexibility by performing daily stretches. Keep up the with Bear’s daily supplements. Teach Bear to identify and indicate human scent indoors. Improve stamina and focus on longer tracks (<100 yards). Reduce (or eliminate) barking at work. Oh haven’t you heard? I’m so done with feeling bad about the tracking test. While I am not over it, I am moving on, negative feelings are – to use a word – exhausting. Between teaching classes, taking agility classes and driving to Winnipeg for herding classes, I’m a busy lady and unfortunately, there’s no room (or time) left for these horrible feelings to overstay their welcome. Corners are not the problem. The problem is distinguishing between ‘looking for corners’ and ‘looking at distractions’. Bear does not have the problem solving skills he needs to find a track after he’s lost it. I have not been handling Bear in such a way as to encourage him to look. I have not been communicating success in way Bear best understands. I am going to take the food off the track. I am going to use articles in place of food. I am going to use my clicker to mark the discovery of every article and reward Bear immediately with a cookie party – therefore making the articles ‘gateways to food’. So far in my tracking reading and online research, there is very little in the way of discussing the applications of using a clicker or marker in tracking. Where I have found a short discussion on this is when it comes to developing an article indication. Just like tracking, these sports involve complex behavior chains and independent behaviors. Just like tracking, no training equipment or food is allowed while you are working so dogs must learn to perform without the use of any training aid, be it an electronic collar, walking harness, head halter, bait bag or clicker. The clicker is used to build competence and enthusiasm for specific behaviors and, once a Bear becomes competent and proficient I have gradually increased my expectations requiring more behavior or better performance between clicks and eventually, I have been able to eliminate the clicker all together. I don’t think the clicker will interfere with what seems to be the method for teaching corners (sadly I don’t think there’s a magic method) which is apply line tension before corners, plant your feet while the dog looks and release tension when the dog commits to the track in a different direction. In fact I am hoping that using our preferred communication tool, the clicker, will make the goal of the game incredibly clear to Bear so that he learns the fastest way to the article (and the cookies) is to use his nose to find the things that smells of the tracklayer. At least that’s what I hope. Fact is, I don’t have much to lose by trying, do I? The following is my interpretation of some of the topics covered in a short (2.5hour) lecture delivered by John (Jack) Wilhelm after our tracking test last Sunday. I am posting them, like I have for other seminars in the past, because writing helps me process things. I’ll add my thoughts/comments at another time. 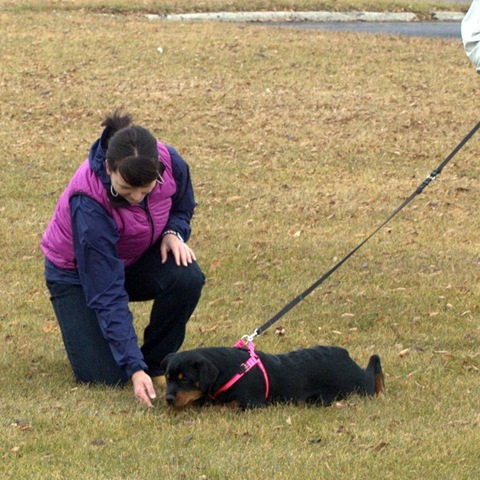 When working with dogs, we need to remember to have an objective for each training session. The objective could be training (teaching) a certain skill or practicing (testing) a skill. According to Jack correcting a dog by yanking on the line/harness is not something a person should ever do but there is a place for correction in tracking. The examples he gave were of a verbal correction “hey get back to work” from the end of the line or dropping the line, marching to the dog and getting in their face. He also mentioned that when dogs make the proper choice after correction – copious praise is due. On the subject of praise it is his opinion that praise is often offered when dogs are not performing the desired behavior and then it becomes meaningless to the dog. What is not okay in tracking is to remove the dog from the track if they are acting up. If the dog is not into it, this is when having an article on hand for the dog to discover is appropriate before ending the training session. The dog should always find something. Do in practice what you plan do to the day of the test. Do not change your handling on test day – this will only confuse your dog. 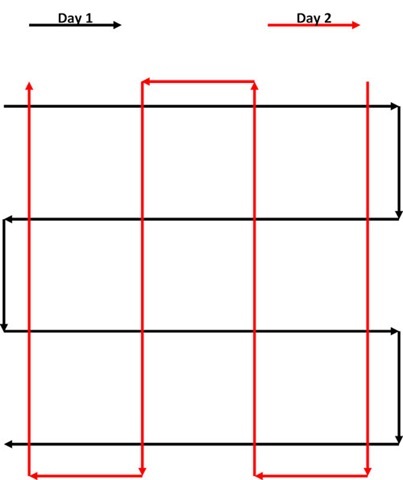 When working with dogs on corners and cross tracks, use back pressure to slow them down at the corner and praise/release line tension when dog locates and commits to corner/appropriate track. Many cross track problems are the result of training which has not challenged the dog. Examples of challenges include cross tracks at very tight angles, walking a cross track carrying weight, even laying the cross track by riding a bicycle. Below is one method suggested for starting to train cross tracks. 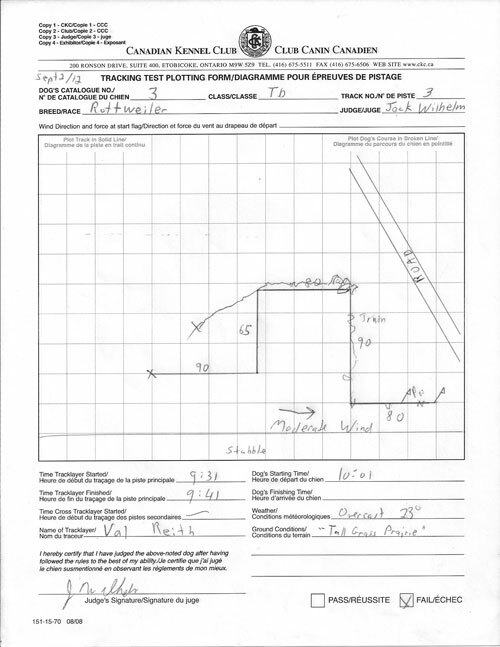 Using the same field lay a track – do your work – and the next day, lay another track your track across it. You can increase difficulty by decreasing the hours between tracks. If dogs are distracted by something and recover, allow the dog to investigate distractions after track is done and harness is removed – ideally off leash. This allows the dog to ‘be a dog’ while maintaining a clear distinction between work and ‘free time’. Practice plotting tracks using landmarks. Practice in different ground cover. Practice with someone following you in rain gear or a hat/sunglasses. Practice driving to a test site and having the dog go to work right out of the car. When dog is off track and looking, stay in one place and let line out as they go farther, pull in as they come nearer. 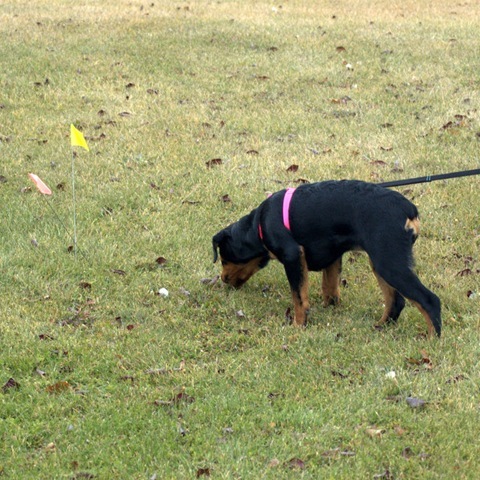 In a blind track, the handler does not know where the track is – having the dog circle the same path is ineffective because the track may be 30 feet behind you. 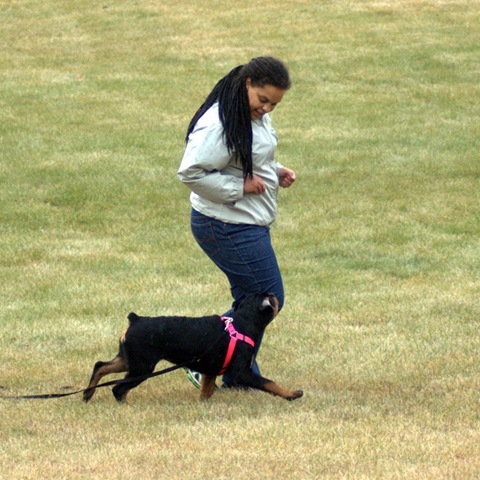 Guiding by the handler– all examples were of handlers guiding with the tracking line by pulling the dog to perform a circle or corner. Handler accidentally corrects the dog– usually when the tracking line gets tangled or the dog takes a hard fast turn and the handler is not ready. The dog is essentially corrected for following the track and may be less likely to seek it out after this. Handlers pull the dog off of track before they have officially started– When start lines are a distance from the road, the track layer will be walking through the exact same area you have. Handlers who punish dogs for sniffing before they get to the track may not be able to get past the start line because the dog is hesitant to continue tracking. 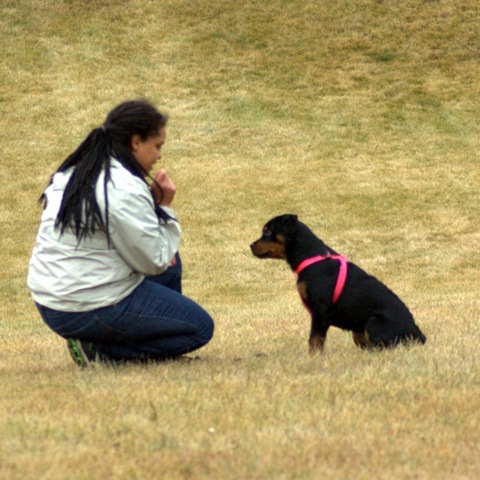 Handlers expecting the picture perfect indication they see in practice – Some handlers wait for the “perfect” indication rather they have seen in practice when the dog has obviously found the article and indicated it in an other way. Waiting too long may encourage the dog to resume tracking and follow the tracklayer’s path off the track. Someone asked a question about what to do with a dog that appears to be on track but that overshoot corners consistently always moving in a straight line with the impression the dog would go straight forever. This brought up a shot discussion about reinforcing the effort vs. reinforcing the behavior you want. Jack suggested that this dog had learned that ‘assuming’ the position meant he would be allowed to continue forward. The solution – lay known tracks and use back pressure to slow him at corners – only releasing pressure when he is on the track. One person asked if there were any books on tracking that he could recommend – he did not as he said he hadn’t really read much in the past few years. We met at a Denny’s for the draw. In tracking there is an advantage to an earlier track – early tracks are often aged less and are likely to have more dew remaining on the vegetation. Dew is good because moisture enhances scent. Before the draw I got to meet a Facebook friend in person! Kristine travelled all the way from Calgary for the test. I don’t know what I expected for the draw but the test organizers had four lovely mugs lined up, filled with dog cookies and wrapped in cellophane. 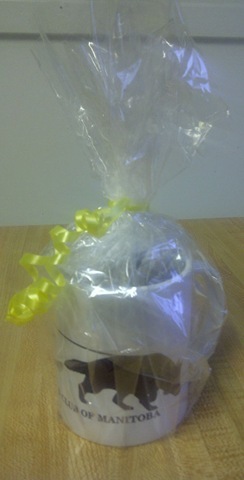 We each chose a mug and on the bottom of the mug was the number corresponding to the track number we would be assigned. We drew 3rd track. Our lovely tracking test memento! I got Bear out of the car, let him pee and then we had a few minutes to wait until the track was old enough. we walked the short distance to the scent pad, and I put Bear’s harness on backwards. Once I got it on properly, I showed him the scent pad and told him to find it. I brought him back to the track once before the 2nd set of flags and we were off. Before we hit the second leg, Bear squatted to poop. I looked back the judge and tracklayer were standing watching but no whistle so once Bear was finished – we continued. After the car, we drove en masse to the test site at Beaudry Provincial Park. The terrain is almost exactly the same as what we have here in Shilo. Natural prairie grass about knee high. We got to watch the first track, which I was looking forward to since I’ve never seen a test. Luckily enough the team was comprised of a novice dog but a an experienced handler. From far, it was really neat to watch. It was obvious to me when the dog was on and off the track. there was only one little “discussion” along the way where the dog was certain the track ran along a ditch and the handler was not so certain. Eventually the dog made her point clear and the handler followed. They found the article and finished the track in what seemed like less than 15. It was very educational – training alone means I never get to watch a team work from far. After track #1, I had to return to our original meeting point in the park because they had to lay my track and I would be able to see the tracklayer at work from track #2. The good news is that meant we would have a relatively fresh track. 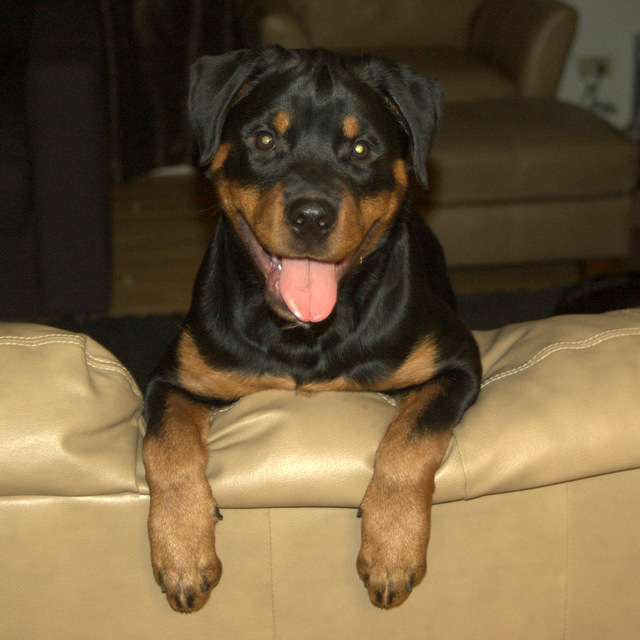 The bad news is that we would not be able to watch Kristine and her Rottie Teah and I would be alone in my car with my nervousness and anxiety. During our wait, I took bear for a walk, a pee, made sure he did not have to poop, gave him a drink of water and then cocooned myself in the car, checked up on Facebook and blogs I subscribe to distract myself. About a half hour after they left me, someone came back to take me to our track. I took bear out of the car and, since we had some time to wait before the track was sufficiently aged, I took Bear out for another pee and organised my tracking line and harness. It was fairly windy (I would guess 25-30km/h) and our first leg was into the wind. I got Bear inbto his harness backwards, then readjusted it, showed him the scent pad and told him to “find it”. On the first leg we had some difficulty and I brought him back to the track once before we hit our 30m marker flags. About 60 feet into the track, Bear crouched down for a poop. I stood, and looked back embarrassingly at the judge – expecting a whistle. Nothing came, so we continued. Before the test, I decided to go wherever Bear lead me. and about 80 feet in he circled a bit and then turned right…we continued on without a whistle so I assumed we made the first corner. On the second leg, we progressed through some vehicle tracks and what looked like a place where deer had lain for a time as we moved forward, I saw the start flags for the final flag ahead and figured our corner was coming. Turning to the right would take us back to the road so I assumed at some point, we were going right. Bear did turn right onto what I assumed was the third leg and then we had some more difficulty working into the wind and through some sort of animal droppings (goose, I think). Bear did a lot of stopping, starting, crossing back and forth, chewing (on lord knows what!?). We went ahead for quite sometime like this – it felt like an eternity. I tried using our find it key, I tried holding my ground and waiting for him to commit but he kept circling and coming back to look at me as if to say “what the heck is going on here?”. he also stopped to listen to train whistles and watch folks pass by on the road. It had been at least 10 minutes and he was starting to huff and puff so I just decided to let him go and see what happened. he found some sort of trail, urine marking a few spots along the way and about 60 feet later, we heard the whistle – It was over. I was relieved and disappointed. Our very kind track layer Val, helped us find the article, even tough I wanted to race back to the car and cry. She also commiserated – her dog did not pass the TDX test on Saturday – she knew how it felt. I think if she had not been there, I would have packed things up and headed home. The last and final track was right after ours and, after blowing my nose and wiping my eyes, I stayed to watch. The team was whistled off about as far into their track as we were. At this point everyone headed back to ‘base camp’ for ribbons the judges comments and lunch. Of the four teams in the TD test, two were successful – the first team and Kristine with Teah! One person said she saw bear indicate the 4th leg and that I interfered with his work. Once we lost the third leg, bikers passing by, trains and just about everything became a distraction. in the past, only prairie dogs have been a distraction for Bear. I got to meet a Facebook friend , her husband and her very sweet dog in person. We got through 2 corners when I was aiming for one. The first 3 legs were through some vehicle tracks and what looked like deer beds – these have been difficult for us. This is the first time Bear has followed a track laid by someone else since the seminar we went to in 2010. This was our first blind track ever. The judge said I had very good line handling skills – moving when Bear was on track, planting when he was off track. As expected, lunch was delicious and folks were very kind. One of the host club members took some beautiful photos. I like the one below a lot. Originals are viewable here. A dog is not whistled off for eliminating on track. I should give some thought to giving Bear more space when we work. I was the only person training on my own. It’s easier to spot a working vs. non working dog from far especially when that dog has a tail! I am going to need to think about what to do next. There is another tracking test in Regina in about 4 weeks and then that’s about it until next year.